BITSAT Application Form: BITS Pilani had released the online BITSAT Application Form 2019 for its Integrated First Degree Programmes on its official portal, bitsadmission.com, on January 4, 2019. The last date to submit the BITSAT Application Form was March 20, 2019. BITS Pilani is one of the top private engineering institutes in India with campuses at Pilani, Goa, and Hyderabad. Every year, lakhs of aspirants try their best to get into a few thousand seats. 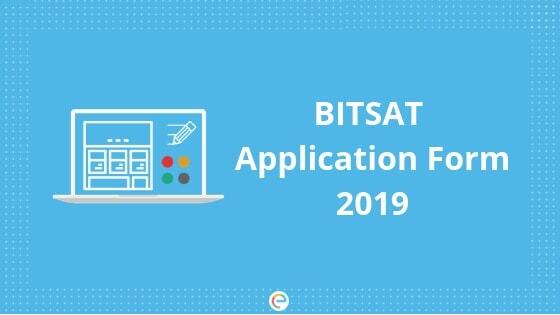 In this post, we will discuss in detail the BITSAT Application Form filling process, important dates, eligibility criteria, steps to apply, etc. Read on to know more about the BITSAT Application Form 2019. Candidates aspiring to appear for BITSAT 2019 are required to first register themselves for the exam before filling the BITSAT Application Form. BITSAT 2019 registration involves providing name, email id, date of birth and gender. Following this, the candidates will be asked to fill the BITSAT Application Form with personal details, academic details, contact information and upload required documents. After registration and filling of the BITSAT Application Form, the candidates will then be asked to pay the BITSAT Application Fees. Application Fees for BITSAT 2019 can be paid online or offline. Admissions will be made based on the merit position of the candidate’s BITSAT 2019 score. Before we go to the eligibility criteria of BITSAT 2019, let’s take a look at the programmes offered in the Pilani, Goa and Hyderabad campuses. For admission to any of the First Degree Programmes, except B.Pharm, candidates should have passed the 12th examination of 10+2 system from a recognized Central or State board or its equivalent with Physics, Chemistry, and Mathematics (PCM). For admission to B.Pharm., candidates should have passed the 12th examination of 10+2 system from a recognized Central or State board or its equivalent with Physics, Chemistry, and Biology (PCB) or PCM. The candidate should have obtained a minimum of aggregate 75% marks in Physics, Chemistry and Mathematics/Biology subjects in 12th examination, with at least 60% marks in each subject and possess adequate proficiency in English. Only those appearing for 12th class examination in 2019 or who have passed the 12th class examination in 2018 are eligible to appear in BITSAT 2019. If a candidate has taken more than one attempt in 12th class or its equivalent, only his latest performance is considered, provided this attempt has been for the full component of subjects/courses prescribed. Students who are presently studying in any of the BITS campuses are not eligible to appear in BITSAT 2019. Candidates who have obtained first ranks in their respective Central and State boards in India for 2019 will be given direct admission to the programme of their choice, irrespective of their BITSAT 2019 scores. Step 1 Go to this link. Step 2 Click on “Allow Me To Apply Online”. Step 3 Click on “New Registration”. Step 4 Fill up your personal details. Step 5 Click on “Proceed”. Step 6 Fill up the rest of the personal details, 12th examination details, and test center preferences. Step 7 Click on “Proceed”. Check if you have entered all the details correctly and click on “Confirm And Submit Details”. Step 8 Upload a scanned image of Photograph and Signature. The size of Photograph should be between 4 kb and 50 kb. The size of Signature should be between 1 kb and 30 kb. Step 9 Make payment for BITSAT application form fee. Step 10 Note down your BITSAT Application Number. Also, take a print out of your application for future reference. The BITSAT application form fee can be paid either through online or offline mode. An e-challan (ICICI Bank) will be generated for candidates who want to make the payment in the offline mode. If a candidate provides wrong information or makes any errors in the BITSAT Application Form post submission of the same, the exam conducting authority has provided a time frame for the BITSAT Application Form Correction between 22nd and 25th March 2019. Q. When will BITSAT 2019 application form be available? Ans. The BITSAT application form 2019 has been released on January 4 in online mode and is available on the official website. Q. In which mode can I fill the BITSAT application form? Q. What is the last date to submit BITSAT Application Form 2019? Q. What is the application fee of BITSAT 2019? Ans. The application fee for BITSAT 2019 exam for the male candidates is Rs. 3150/- and for female candidates is Rs. 2650/-. Q. Can we make changes in the filled application form? Ans. Yes, the correction window for the candidates will be opened from March 22 to 25, 2019. We hope this detailed article on BITSAT 2019 Application Form has been helpful. If you have any query regarding this article or the exam in general, drop a comment below and we will get back to you.